Tag line: "Be bold. Be brave. Be epic"
With all due respect to their previous films, the gang at Laika Studios, the stop-motion animation house behind Coraline, Paranorman, and The Boxtrolls, have with 2016’s Kubo and the Two Strings produced what is thus far their masterpiece. It is a stunning achievement from start to finish. As the movie opens, Kubo’s mother (Charlize Theron) is on the run, fleeing from her father the Moon King (Ralph Fiennes) and her two sisters (both voiced by Rooney Mara), all of whom are anxious to get their hands on her infant son Kubo (before their escape, the Moon King tore Kubo’s left eye out). Following a rough voyage at sea, mother and son eventually make their way to a remote island, where they will spend the next several years in seclusion, never venturing outside at night (to avoid the notice of the Moon King). Now a young boy, Kubo (Art Parkinson) spends his days telling stories to the local villagers, using his mother’s magic shamisen (a guitar with only 2 strings) and the ancient art of origami to relate the tale of Hanzo, the mighty warrior. As it turns out, the real Hanzo was Kubo’s father, who gave his life so that he and his mother could escape. One day, while attending a festival, Kubo tries to contact the spirit of his deceased dad, but in the process fails to return home before nightfall. As a result, he is tracked down and pursued by his aunts (during the chase, the two sisters destroy the entire village). Kubo is saved only by the quick thinking of his mother, who, before being killed by her sisters, uses her last bit of magic to send Kubo to a distant land. Along with a very strict monkey (which, earlier, was nothing more than a wooden trinket he kept in his pocket) and a forgetful man-sized bug that was once a Samurai (Matthew McConaughey), Kubo sets off to find three enchanted weapons (a sword, a breastplate, and a helmet) that will help him defeat his grandfather, The Moon King, thus avenging the deaths of his mother and father. But will he locate these magical arms in time to save himself, or is Kubo destined to spend eternity at his grandfather’s side in the heavens, far away from the earthly realm he has grown to love? 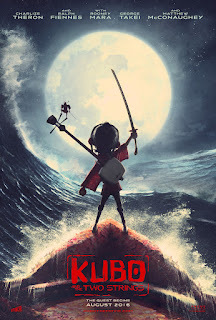 With its seamless marriage of stop-motion and computer wizardry, Kubo and the Two Strings weaves an epic, magical tale of family and honor, bringing us along on what is one of the most imaginative adventures I’ve experienced in some time. There is action, to be sure: Kubo and his new friends the monkey and the beetle battle a giant-sized skeleton; and, while at sea on a ship made of paper they are attacked by one of Kubo’s aunts, who strikes as a storm rages around them. These scenes, and many others, are packed with thrills, and the entire second half of Kubo and the Two Strings is chock full of excitement. But what’s truly amazing is that the quieter moments of Kubo and the Two Strings are every bit as enthralling and visually spectacular as its action sequences. The scene in which Kubo, using the shamisen and dozens of sheets of paper, relates the adventurous exploits of Hanzo to the villagers is absolutely marvelous; each strum of the shamisen brings the paper (folding itself into origami figures) to life, a sequence so superbly realized that it even earned a George-Takei-patented “Oh My” (the actor provides the voice of one of the villagers)! And, like all great animated films, the spectacle in Kubo and the Two Strings enhances the movie’s story as opposed to detracting from it, bringing the characters, and their plight, vibrantly to life. To be fair, I have yet to see most of the movies nominated for this year’s Best Animated Feature Oscar, but I can’t imagine any of them providing an experience as satisfying as Kubo and the Two Strings. It’s more than the best animated movie of 2016; it’s one of the finest of the new millennium, reaching heights in storytelling and art that only the likes of Hayao Miyazaki has achieved. Kubo and the Two Strings is destined to become a classic. I missed this one on Twitter, but I'm glad that I randomly noticed the review while reading your Conan the Barbarian analysis (awesome, btw). I saw Kubo in the theater with my young daughter, and both of us were mesmerized. It is a truly excellent film - visually stunning and deeply meaningful. Being so young (five), my daughter had a lot of questions, but we've had some very good conversations about family, loyalty, and tradition - all thanks to Kubo. I have never even HEARD of this movie!